This module starts by describing common cloud characteristics. Cloud computing is drastically changing the way IT and data centers are being architected today. Lesson 1, "Describe Common Cloud Characteristics," introduces the technical concepts needed, including NIST’s cloud definitions, and also cites the main milestones that enabled the evolution of computer science to this modern service delivery model. Lesson 2, "Describe Cloud Service Models," presents cloud computing classifications based on their offering (Infrastructure as a Service [IaaS], Platform as a Service [PaaS], and Software as a Service [SaaS]) and examples for each of them. Module 2 describes cloud deployment models, detailing how cloud computing environments can be classified according to their users and introducing the basic concepts, such as public clouds, private clouds, community clouds, and hybrid clouds. Lesson 4, "Describe the Components of the Cisco Intercloud Solution," describes the challenges hybrid cloud deployment models face and discusses the Cisco Intercloud strategy, how it normalizes the integration of heterogeneous clouds, and the solutions that make it possible: Cisco Intercloud Fabric. Click here to access a new version of this title which offers both streaming and download access. 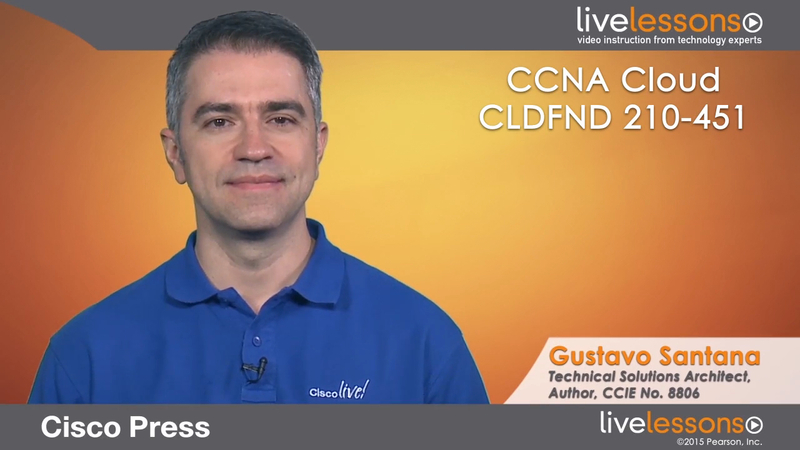 You can also purchase the entire CCNA Cloud solution (CCNA Cloud LiveLessons Library: CLDFND 210-451 and CLDADM 210-455) here.